At the start of what is expected to be a busy week, Asian markets closed mixed but with concerns over the weekends that President Trump had decided to remove the national security advisor expected to wobble markets. Consequently, the Nikkei took much of the brunt of the action after the Yen saw a fresh flight to quality, taking it to mid 105’s. The -0.9% decline for the Nikkei was a disappointment as we had seen early gains for the index. Exporters and tech led much of the move but the whole markets remains vulnerable as concerns over Abenomics and the scandal persist. Most other core held in reasonably well give or take the odd 0.25% point. SENSEX was again hit after a brief opening hour in the sunshine. As the currency drifted so did stock enthusiasm and continued last weeks weakness. 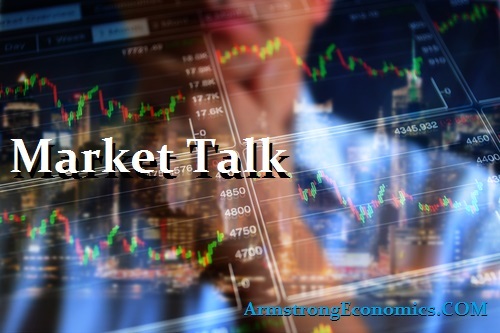 Worries over the potential trade wars with the US weighs on prices and given the DOW’s decline today, Tuesday is expected to be another heavy session. All this news is also weighing on the A$ with it losing nearly 5% in a month. With the FED expected to move this week you can probably expect the Aussie to remain weak. BREXIT was top conversation piece for much of todays European market hours. The UK and EU agree on a 21 month transition period and cable rallied 0.75% on the back of the news. However, it may be a little early to celebrate as we still have an anticipated rate hike from the FED, UK Retail Sales and the Bank of England announcing later tin the week. In UK domestic news, reputedly the UK government is restructuring Northamptonshire County Council’s financial affairs due to “terrible” management. That didn’t help the FTSE, which joined other European indices trading lower and closed down 1.7%. Energy and resources led much of the decline as DAX and CAC both also lost 1.25%. Markets closed on their lows influenced heavily by the lower US markets. with a 1bp parallel shift across the curve. Facebook lost 6% which was a major drag on the index. Encouraging to see the DOW bounce 150 points in the final few minutes of trading and an additional 100 once futures were triggered. Japan 0.04%, US 2;s closed 2.30% (+1bp), 10’s 2.85% (+1bp), 30’s 3.09% (+1bp), Bunds 0.57% (u/c), France 0.81% (-1bp), Italy 1.96% (-1bp), Greece 4.15% (u/c), Turkey 12.52% (+13bp), Portugal 1.72% (-1bp), Spain 1.32% (-3bp), and Gilts 1.44% (+1bp). 3M/OIS spread broke above 50 today, which many believe is a prediction the internationals are short dollars.